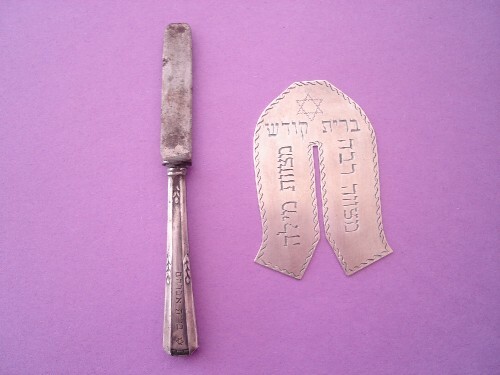 Below is a Polish knife and shield set, late 1800s. 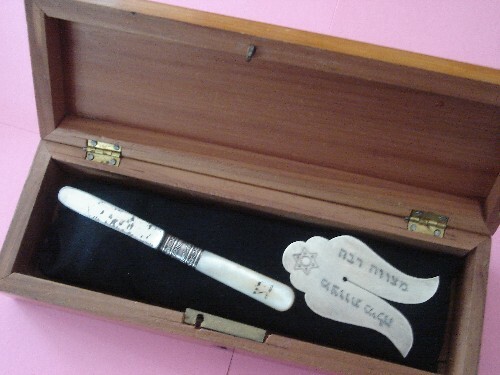 The knife handle is made of ivory. The case is leather. 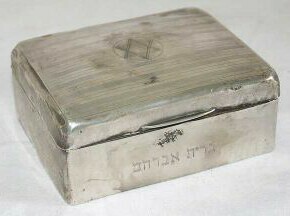 The seller attributed the boxed set on the right to circa 1900, Poland. 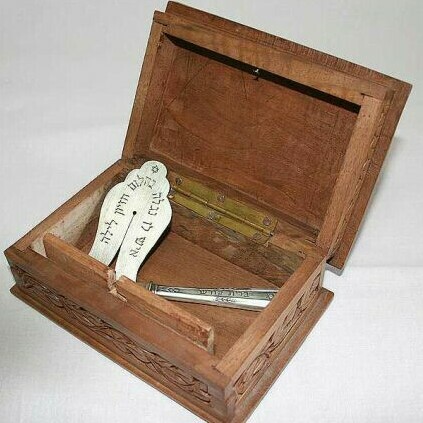 The box is made of carved wood. 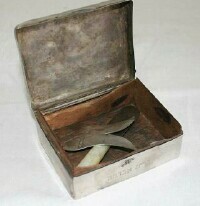 This is another circumcision set from Poland, estimated to be from the late 1800s. 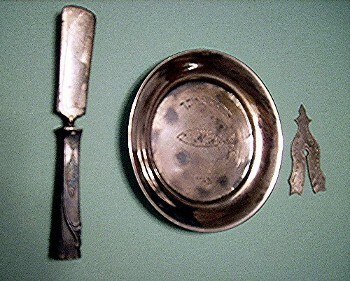 The knife and plate are engraved with a fish, a symbol of fertility. 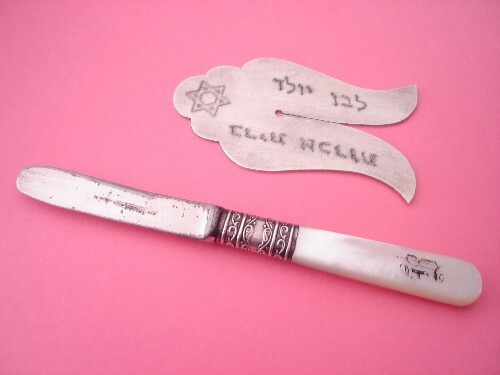 Below, an Israeli eBay auctioneer sold this silver knife and shield set, circa 1920. 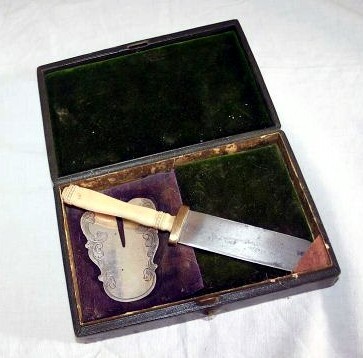 The same auctioneer sold a knife and shield set in a wooden box, pictured below. He claimed that the set was from Germany, 19th century. There are two problems with this set. First, the knife, while beautiful with its mother-of-pearl handle, has a faint stamp on the blade which reads "Hausmann, New Orleans." The Hausmann family operated a jewelry store in New Orleans from the late 1800s to the early 1900s. Second, the shield pictured in the auction was not the same shield that was sent to me. Live and learn! 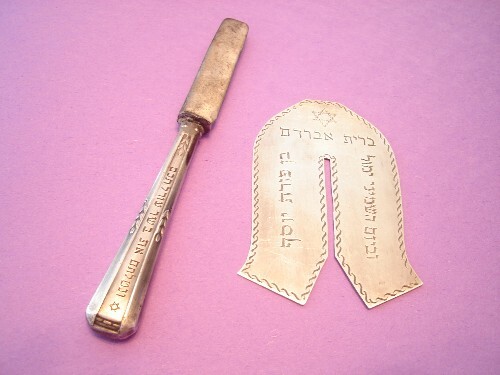 Below is a fine silver circumcision set from Birmingham, England, 1923. 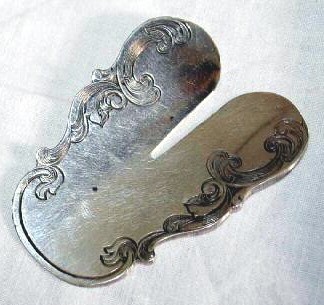 The hallmarks identify the makers as Cornelius Saunders and Francis Shepard. The knife has a mother-of-pearl handle. The next section features some thought-provoking circumcision cups. This section also touches upon the controversial metzitzah b'peh. Please click the button below.